I used it in my Mitered Non-Cross Blanket. However, that extra yarn over also means more yarn is used. That’s the point, isn’t it? The extra yarn gives you more stretch. Quite honestly, it also was not necessary in a garter stitch blanket. Seriously. By the time I thought about it, it was too late to switch to a different bind off method unless I wanted to rip the border on all the finished squares and re-knit them. I wasn’t willing to do that, but I was worried about running out of the natural colored yarn I was using for the border. Why is it necessary to re-knit those squares? 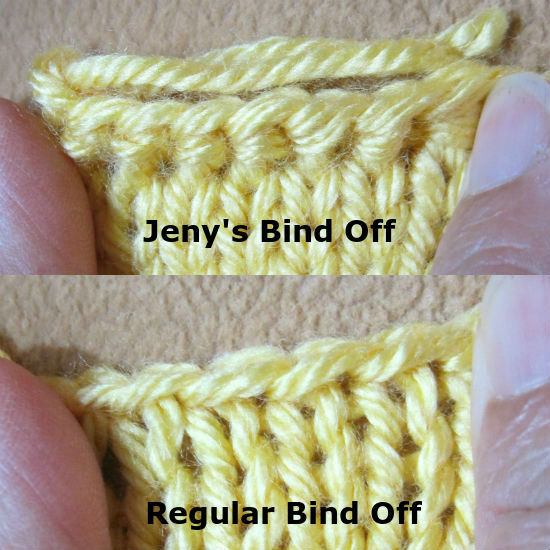 Jeny’s bound off stitch is visually different from regular bind off stitch. From the pictures on the left, you can see that bound off stitches with Jeny’s method look like they are wearing turtle neck sweaters. That’s from the extra yarn over in the bind off. However, regular bind offs have a tendency draw in if you aren’t careful. Why? All that extra stitch manipulation pulls and tugs at the recently bound off stitch, which makes them tighter. This bind off is not stretchy at all, when compared with other bind off methods. If stretch is not required, like for a blanket or a flat edge of a sweater or scarf, this is an excellent bind off. * The only bind off I like better is Elizabeth Zimmerman’s sewn bind off, but that requires extra equipment — a darning needle, and guesstimating how much extra yarn you need for the bind off beforehand. I never guess right. If you are binding off a very long edge, the length gets unwieldy and ratty from drawing through all those stitches, unless you are willing to splice in new yarn.